There are concerns within the Ghana Police Service, following last week’s promotion of some senior police officers by President Akufo-Addo, which saw the elevation of the Director-General of Criminal Investigations Department (CID), MaameYaaTiwaa Addo-Danquah and the Director-General in-charge of Police Operations, George Alex Mensah and four others, to full Commissioners Of Police (COP). 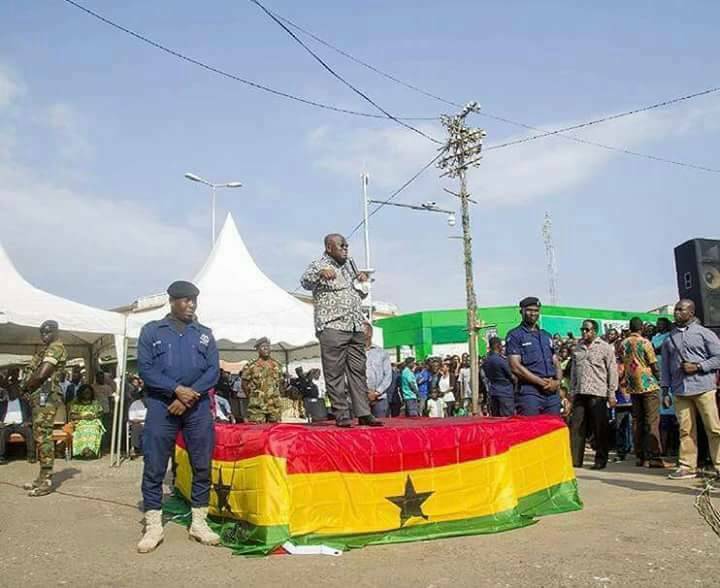 Although, the promotions were said to be upon the recommendation by the Police Council led by Vice-President Dr. Mahamudu Bawumia, reports are that, it has left the Police Service, very crippled with juniors officers promoted far above their senior officers, and this according to The Herald’s insiders is going to affect morale and hard work in the service. It is not clear, what went into the promotions, but many have said, the promotions were influenced by political undertones, naked favoritism, and daylight tribalism. The Herald’s information is that, three senior officers, who are Deputy Commissioners of Police (DCOP) were bypassed in the promotions, although they have spent four to five years at the rank of Deputy Commissioners, while most of the officers President Akufo-Addo promoted, have in some cases, spent less than two years at the rank of DCOP. Names picked up by this paper, include the Central Regional Police Commander, DCOP Paul Manly Awini, who have spent almost five years on the rank of Deputy Commissioner, the Western Regional Police Commander, DCOP Redeemer Dedjoe, who had spent over four years on the rank and the Director-General in-charge of ICT, DCOP Simon Yaw Afeku, who spent almost five years as Deputy Commissioner. These officers, The Herald learnt, have now had to be working under and saluting their juniors, who had been promoted over them. The CID Boss, was together with five other senior officers elevated from the rank of Deputy Commissioner of Police to Commissioner of Police. She was promoted to DCOP on November 1, 2017 from the rank of Assistant Commissioner and confirmed as CID boss on January 24, 2018, following the dramatic exit of Bright Oduro, the then CID boss. The others are; Mr George Tuffuor, Director-General of Finance, Mr Alex Amponsah Asiamah, Director-General of Services, Mr George Alex Mensah, Director-General of Operations, Mr Alphonse Adu-Amankwah, Eastern Regional Commander and Mr Timothy Yoosah Bonga, Northern Regional Police Commander. Most of them, have spent less than two years at the rank of Deputy Commissioner of Police. The previous promotions were at the behest of the Akufo-Addo government. A statement signed by Director of Public Affairs at the Police Headquarters, DSP Shiella Kessie Abayie-Buckman, announced last Friday, that three Assistant Commissioners of Police, have also been promoted to the rank of Deputy Commissioners of Police. Although, the announcement came out on Friday, April 5, 2019, their promotions took effect from April 1, 2019. According to the statement, the Police Council, has also promoted two other officers to the rank of Assistant Commissioners of Police, one officer to the rank of Chief Superintendent of Police and eight others to the rank of Chief Superintendent of Police. The statement which was issued on a memo, signed by the Inspector-General of Police (IGP), Mr David Asante-Apeatu, said three others, Mr Francis AboagyeNyarko, Director-General of Private Security Operations, Mr Ernest KwabenaOwusu, Deputy Regional Commander of Tema and Felix OfosuAgyemang, Deputy Northern Regional Commander have been promoted from Assistant Commissioner to DCOPs, while Chief Superintendent KwasiOfori and Mrs Faustina AgyeiwaaKoduaAndoh-Kwofie have been promoted to Assistant Commissioners. Nine other officers, all medical doctors, have been promoted to Chief Superintendents. Meanwhile, The Herald, has also picked up claims that some junior officers on the rank of Sergeant are being promoted to Inspectors, while Inspectors are also being elevated to the rank of Chief Inspectors, largely on the basis of political and ethnic considerations. Some of them are being sent to the Police Training College to be upgraded into Senior Officers.